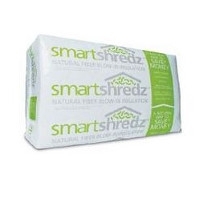 Service Partners is pleased to introduce SmartShredz, a new cellulose insulation product. This product will be marketed to the independent lumber/building materials dealer channel. SmartShredz’ stylish packaging will provide the dealer with a product that attracts the Do-It-Yourself customer while fulfilling the needs of the insulation professional. The product will be supported by a strong in-store merchandising program designed for the dealer showroom.